I took my little to the Village Lights festivities tonight. We had a great time hanging around at Book Loft for an hour before they turned on the lights. 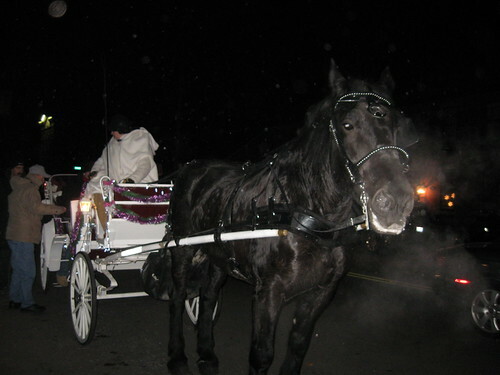 Then we hopped in line for the one horse open sleigh rides. She took this picture of the horse when another group was getting on. You could fit 4 people comfortably and squeeze in 5 if you had small kids. It’s a good thing we happened upon the line early as it got long fast and with each trip being about 10 min the wait time was pretty long.